Students for Life are pro-life students concerned about the killing of unborn babies and emotional & physical damage done to their mothers. • Promote the Sanctity of Human Life. 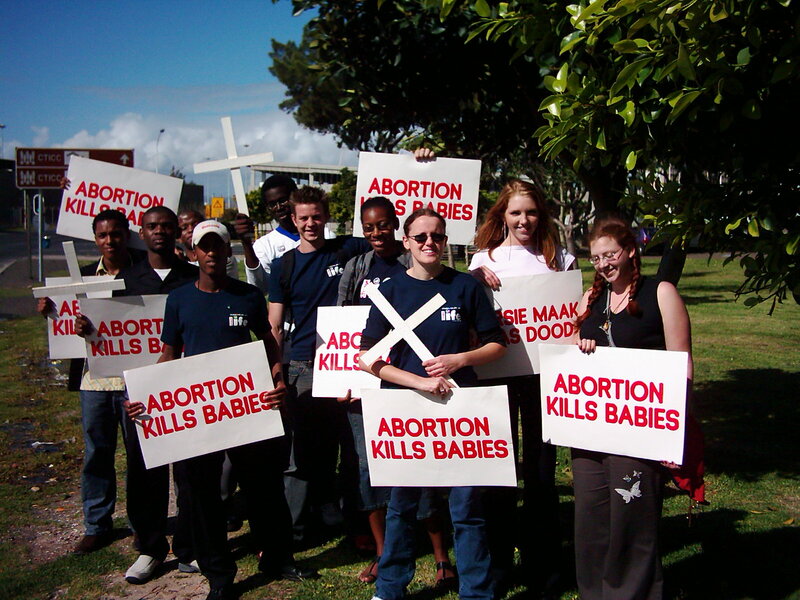 • Student mothers and women seeking abortions at Groote Schuur, are properly informed before making a decision. • Speak for those who cannot speak for themselves (especially the unborn). • Debate with and educate staff and students. • Equip the future leaders of our country to defend human life. • Support the Health Professionals Conscientious Objection campaign. • Create awareness through meetings, talks, posters, pamphlets and demonstrations. • Visit parliament, hospitals & pregnancy centres. • When you were only four weeks in your mother’s womb, your heart began to beat. • At six weeks old you began to move and your brainwaves could be recorded. • Five weeks later, you smiled. • And at twelve weeks you were already sucking your thumb. • By fourteen weeks, you could hear and would jump if a door slammed. • Until 20 weeks, unborn babies are killed on demand. • They are sucked apart, cut up, chemically suffocated or forced from the womb. Some have been born alive and then killed or left to die. Why is the right to life important to us? hospital, aborts more than any other hospital – and students are asked to help with the killing. • Most mothers are NOT counselled beforehand and many regret it and suffer painful memories afterward. • Some students fall pregnant. We can help them make informed decisions and support those who keep their babies. • Inform yourself on Right to Life issues like abortion and euthanasia. • Learn a pro-life perspective on your university course in health sciences, genetics, law, ethics, philosophy or social science. For example, medical students may be asked to assist with abortions. What will you say? Law students need to know why our law and constitution need reform. What should an education student teach about lifeskills at school? What will you do if someone you know falls pregnant? • Learn to debate your lecturer and influence your class. • Show you care. Help save unborn babies from abortion & mothers from guilt and heartache. • Educate yourself and friends. • Join our society – SIGN UP TODAY! Add your voice to support the unborn.